There are fewer stones, but a clearer circle at Milltown of Rothiemay. To get there, buses are few and far between, so drive the scenic route west from Bridge of Marnoch, a pretty, beech-lined winding road following the River Deveron. For keen walkers there is a steep climb up Bognie Brae beside the hotel, a mile up to the top of Fourman Hill for spectacular views up and down the Deveron valley, the river snaking its way between large estates and steep hills. From here you can see Rothiemay. From the Marnoch/Rothiemay road, the stone circle can be seen in a field on the left (S) behind the Mains of Rothiemay before you reach the village. Ask at the farm first. 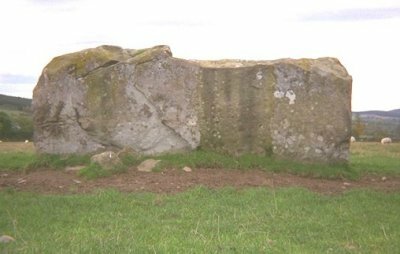 No internal ringcairn remains but four big mossy stones and the famous but mysterious cupmarked recumbent stone survive. The hundreds of cupmarks on the inner face of the stone defy explanation. Are these ancient star maps? Who knows; there have been a few theories ranging from solar or lunar observations, even maps of fresh water wells.